Buffalo Trace Distillery, has announced the launch of the second release of its award-winning E. H. Taylor, Jr. Four Grain Bourbon Whiskey. 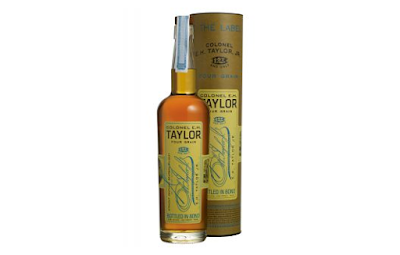 E. H. Taylor, Jr. Four Grain Bourbon Whiskey - Second Release (50% ABV) was distilled in 2005 and was produced using a distinctly different bourbon recipe to those normally used at the Buffalo Trace Distillery, comprising of corn, rye, wheat and malted barley. The four types of grains used, were chosen as they are the four grains E. H. Taylor would have had access to when he set up shop at Buffalo Trace (then the O.F.C. Distillery) in the late 1800s. During the 1860s, Taylor traded in grains and learned that they can vary tremendously from different farmers and harvests. Taylor consistently wanted the products produced in his distillery “of upmost class,” right down to the grains. E. H. Taylor, Jr. Four Grain Bourbon Whiskey - Second Release, has been described by the brand, as having a nose reminiscent of a chocolate roast malt, a flash of spice attached to barely perceptible ulmo honey, followed by a taste complemented by deeper Manuka honey and liquorice notes. This latest release from Buffalo Trace, is part of the Colonel E. H. Taylor, Jr. collection, which first launched in 2011. Previous releases include: Old Fashioned Sour Mash Bourbon, Single Barrel Bourbon, Warehouse C Tornado Surviving Bourbon, Barrel Proof Bourbon, Straight Rye Whiskey, Small Batch Bourbon, Cured Oak Bourbon and Seasoned Wood Bourbon. The second release of E. H. Taylor, Jr. Four Grain Bourbon Whiskey, will be available in limited quantities, later this spring in the US, for a RRP of $69.99.